Hamilton Palace was the largest and finest non-royal residence in Britain. Its destruction and the dispersal of its art collections is now regarded as one of the greatest ever losses to our national heritage. The town of Hamilton takes its name from the powerful and illustrious Hamilton family, and the Duke of Hamilton is still the premier peer of Scotland. Hamilton Palace was the family seat from at least 1591 until 1919. 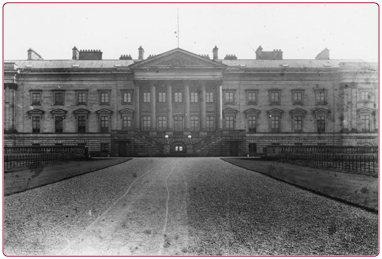 Demolished in the 1920s as a result of mining subsidence, the Palace stood in the Low Parks of the Hamilton estate, in the area now occupied by the Palace Sports Grounds. In 1684, the 3rd Duke and Duchess of Hamilton began their "Great Design", a major rebuilding programme, which was to turn Hamilton Palace into the largest country house in Scotland. The new south front was the crowning glory, and included a stunning entrance portico in a style that had never before been seen in Scotland. The Palace reached its heyday in the time of Alexander, 10th Duke of Hamilton. Duke Alexander desired a country residence that would not only provide an appropriate setting for his famed art collection, but also reflect his family's proud history and status. The Palace was now massively enlarged and enhanced, with work beginning in 1822 on a new north front, a servants' wing, and additional offices and stables, designed by David Hamilton, Glasgow's leading architect. The interior was in keeping with the grandeur of the exterior, and the huge apartments were crammed with paintings, statues, furniture and art treasures from around the world. It was enjoyed throughout the Victorian era by a who's who of British and European nobility, celebrities and socialites of the day. This golden age was not to last. The programmes of rebuilding and art collecting by the 10th Duke and his successors had led to mounting debts and put a strain on the estates. A major sale of the Palace art treasures took place in 1882 at Christies auctioneers in London, and raised the huge sum of £400,000, the equivalent of around £24 million today. After the sale, the Hamilton family spent very little time in the Palace, and, in 1919, moved to Dungavel House, their hunting lodge near Strathaven. It was coalmining which finally brought about the destruction of Hamilton Palace. The Hamilton family had been leasing out mineral rights in the Palace Grounds since 1882, and by 1915, mining was threatening the stability of the Palace. In 1919, the colliery company was asked to give up its lease, but it refused, and the Palace's fate was sealed. The building was sold to demolition contractors in 1921, and took around 8 years to completely demolish, during which time the west wing was temporarily converted into houses for homeless miners' families. The Palace Grounds now contain a retail park and sports complex. The Palace itself may be gone, and its art treasures now in major museums, galleries and private collections around the world. However, the Mausoleum, the hunting lodge at Chatelherault, and the ducal buildings that make up Low Parks Museum all survive as a reminder of the glory that once was Hamilton Palace.